Fernando Alonso secured his first win of the season - and the 27th of his career - at the British Grand Prix thanks in part to a botched pit stop which allowed him past early leader Sebastian Vettel. Vettel extended his lead in the world championship by holding off a determined late charge from Mark Webber to take second, while Lewis Hamilton saw his chances disappear as he was forced to conserve fuel in the final stages. In an epic finish, he crossed the line inches ahead of Felipe Massa with the two cars coming together as they raced into the final corner. Jenson Button's hopes ended when his McLaren crew failed to attach a wheel nut at a pit stop and he was forced to retire. Nico Rosberg came home sixth after coming out on top of a long battle with Sergio Perez, and Nick Heidfeld, Michael Schumacher and Jaime Alguersuari rounded out the top ten. A heavy shower before the race left most of the track wet, with only the final sector still dry. As a result the whole grid started the race on intermediate tyres, with the start crucial on a bone dry section of track. It was Vettel who got the better of Webber and led in to turn one, with Alonso holding station in third and Button passing Massa for fourth. By the end of the first lap Vettel had a strong lead of over a second and Hamilton had already made his way up to seventh before passing Paul di Resta up the inside in to Stowe. Button was struggling early on and Massa soon passed him in to turn three, with Hamilton following him through a few corners later. Hamilton was reveling in the wet conditions and was soon on the back of Massa. Michael Schumacher was the first man on to slick tyres after contact with Kamui Kobayashi, and as soon as he started setting fastest sectors the rest of the field streamed in to the pits. Massa had to wait to pit as Alonso came in alongside Webber and Hamilton, allowing the McLaren to jump him in the pit stops. Vettel came in a lap later, along with Massa, and had a substantial lead when he rejoined. Massa came out just in front of Button though, and Button pulled a great move around the outside of Stowe and the inside of Vale to take fifth. Soon after, Hamilton dived down the inside of Alonso in to Copse for third, and the McLaren looked quick as Vettel's lead from Webber had suddenly disappeared. Vettel did react to pull out a three second lead as the top four ran within ten seconds of each other, but it was Alonso who started to show the pace to challenge the Red Bulls. Hamilton was unable to pull a gap and Alonso used the DRS to cruise around the outside for third place, before setting off after Webber. Webber pitted to try and get the undercut on fresh rubber but Alonso was quick and stayed out for an extra lap. 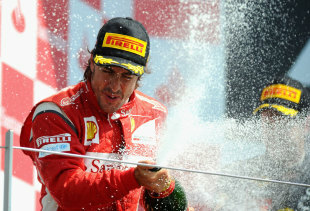 It was when Alonso pitted that the race really swung, as he followed Vettel in to the pit lane with a small lead. Red Bull had a problem with Vettel's left rear, however, and Alonso left comfortably in the lead. When Vettel rejoined he was third behind Hamilton as Webber had endured a similar problem, and Alonso was able to streak away in clear air. Hamilton did a good job of holding off Vettel until the final round of pit stops, before slipping back behind Webber as he had to slow dramatically to save fuel. Webber had been unable to make an impression on Vettel and had Button closing him down, but with Webber pitting a lap earlier McLaren needed a quick pit stop to gain the position. A right front problem however saw Button leave without the wheel attached and he was forced to retire at the end of the pit lane. The drama continued until the final corner, as first Webber closed in on Vettel but was then ordered not to pass him by team principal Christian Horner, and then Hamilton had to try and hold off a charging Massa for fourth. Massa tried to pass around the outside in to Vale, and there was contact before Hamilton dived back up the inside of the final corner to retake the position by less than 0.1s.